Trinidad Conservation Project | A partnership to improve lives, enrich souls and restore the environment in rural Honduras. 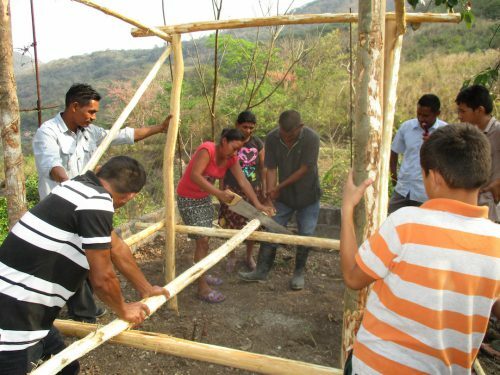 Anibal Rios (shown on left), a farmer from El Cablotal, is showing farmers in El Puente how to build a chicken coop. Predators kill the hens and eggs if left unprotected overnight. One of the strongest principles of Vecinos Honduras (our TCP partner) is that outsiders can bring new knowledge of health or agriculture to a community but the people in the community must learn to teach each other campesino a campesino. To our delight, we found out in visits to the five TCP communities during our trip to Honduras in early March, that the people we meet really like to be taught by each other and to teach each other. In early January 2016, a gifted facilitator for Vecinos Honduras in southeastern Honduras gave eight workshops to people in the five TCP communities. Her name is Balvina Amador and her surname (meaning “lover” in Spanish) gives a hint of the affection she generated in each of these communities. She taught people how to build a stove that consumes one tenth as much wood as a traditional stove. She taught people techniques to make their homes safer and healthier and she taught them how to grow and balance food in the three basic food categories. In February 2016, another experienced facilitator, Melvin Molina, gave six workshops on techniques to conserve and reuse water—various techniques for constructing a filter for gray water out of common materials such as used tires. By the time we four arrived in March, half a dozen members of these five communities had already taught one or more workshops to other families. In total, local people in the communities had taught eleven additional workshops, passing on what they had learned from Balvina or Melvin. The local leaders who taught these workshops included men and women and young people ranging from as young as 13. All of them expressed great satisfaction at being able to pass on what they knew to their neighbors or to people in nearby communities. After her stove was created in a workshop taught by Balvina. Lucinda Martinez, a mother of four in El Puente, taught other families how to build a wood-conserving stove. After years of struggle in this community with poor access to water, Lucinda said the experience of working together gave her confidence in her community’s ability to make life better. In El Cablotal, Mercedes Rios, another mother of four, taught three other families how to build a stove. She told us of her satisfaction that El Cablotal families were working together to make progress. She was just named an officer of a newly- formed rural credit union for El Cablotal. Antonio Gamez, a farmer in La Majada, travelled to Agua Zarca to show several farm families there how to build a chicken coop. Natividad Peña, a farmer in El Puente, teamed up with the youngest community trainer, middle school student Byron Bueso, to conduct a workshop on how to build a wood-conserving wash basin and filtering system to turn gray water (from washing clothes and dishes) into water for a garden. Byron lives with his grandmother and two uncles, while his parents work in the city, and has expressed a strong desire to learn everything he can about how to build improvements to their lives. We could observe that the value of local families teaching each other how to build a wood-conserving stove, or a chicken coop, or a gray water filtering system goes far beyond the value of the thing that is built. The experience for the participants creates satisfaction and even joy and the desire to work together again to improve the whole community. Click to see Teaching Others photos.